Domaine Comte Georges de Vogüé is a historic domaine producing some of the most ethereal, complex, elegant wines in Burgundy. It has extensive holdings, 12.5 hectares producing about 40,000 bottles annually, in some of the most sought-after grand cru sites like Musigny and Bonnes-Mares. The domaine traces its roots back to the 1400s when Jean Moisson established the property. The current name of the domaine is credited to Comte Georges de Vogüé who was at the helm of this domaine for over fifty years – the current owners, the 20th generation family members Comtesse Claire de Causans and Marie de Ladoucette are his two granddaughters. There is a talented trio who manage the domaine: Francois Millet in winemaking, Eric Bourgogne in the vineyard and Jean-Luc Pepin running commercial activities. The domaine is not certified organic, but the vineyards are farmed organically; no herbicides or fertilisers are used and ploughing is done by horse or tractor. Little new oak is used during the maturation process; approximately 15% is used for the village Chambolle and 35% for the Grand Crus. Tasting with Francois Millet is always a calm, spiritual exercise. He always offers the most visual, poetic descriptions about the vintage and of the different wines produced at Vogüé. For the 2011s, he describes them as easy to enjoy afternoon jellies with the spirit of the late afternoon sun. The 2012s on the other hand are hard candies with a sweet, syrupy core embodying the spirit of ‘the joy of living’. The 2015s are like brunch on a summer day, sitting out in the sunshine on your porch. Francois describes wines like images within a manga (comic book) – visual, colorful, sharp scenes that capture the essence of a mood and place. Vogüé is without doubt the epitome of Chambolle-Musigny, embodying the village’s historical significance and uniqueness in the Cote de Nuits. All the wines have Chambolle’s glorious perfume, filled with exotic wild flowers and sweet red berries; they also have the silkiest tannins and an elegance and delicacy that few other wines of Cote de Nuits ever achieve. Much of their success has to do with the impressive vineyards that they cultivate – Vogüé is the largest holder of Musigny grand cru vineyards, with 7 hectares out of a total of 10. Their wines are so sought-after, at even the village level, that prices are often much above their neighbours. The vineyard is divided by older and younger vines, with only the older vines going into Musigny grand cru. The younger vines from Musigny goes into the Chambolle-Musigny 1er Cru. 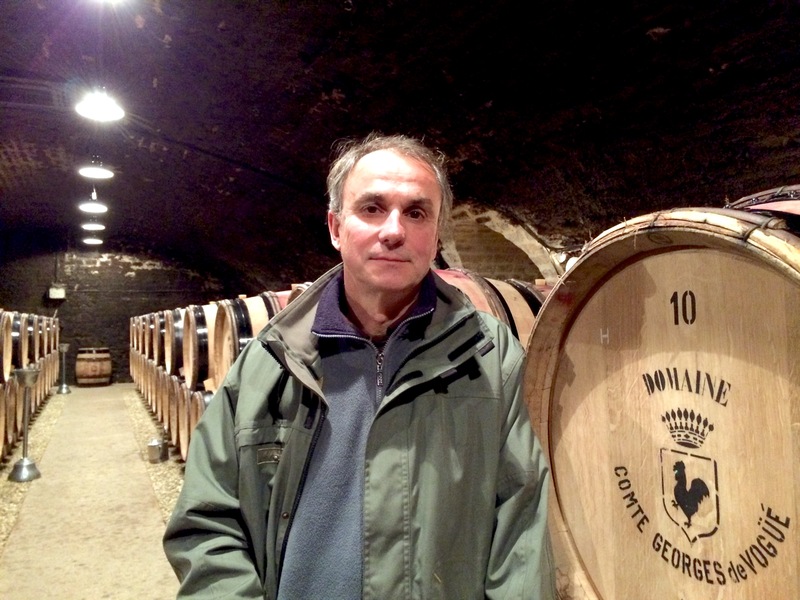 For Francois, Musigny is the patriarch of the ‘family’ or portfolio of wines made at Vogüé. “He [Musigny] is a noble gentleman,” says Francois. “And of cours he is married to the love of his life, Les Amoureuses.” Bonnes-Mares on the other hand is the eccentric uncle, one who likes to go off on wild adventures. All of Vogüé’s wines are unforgettable – always consistent, even in challenging vintages. A sensual, complete, intense wine with great depth and intensity. There is both power and finesse here with flavors that are complex and layered. An intoxicating array of red flowers on the nose with minerals, raspberries and sweet cherries on the palate; all supported by silky tannins. The finish is long and lingering. I love the purity and precision and the delicate character of this wine. Sensational! In this vintage Les Amoueurses has layers of expressive red flowers, from roses to violets and a mix of wild flowers. Delicate yet focused and pure with wonderful clarity of flavors – a wine that is linear and deep. The finish is very long. The 2013 Les Amoureuses has a beautiful nose, although this year it is more reserved than usual. The palate offers red flowers, roses and raspberry fruit with a fine line of acidity running through it. A lovely Amoureuses that will take time for the fruit to come to the fore – at the moment it is restrained leaning more toward minerals and herbs. Beautifully perfumed and silky, this is a gorgeous Amoureuses. The wine is minerally on the palate with bright red fruits and a lingering, persistent finish. This is a fine, seductive vintage with charming flavors and at the same time, possessing sufficient energy and backbone to age for many decades without any problem. Vogue owns 0.56 hectares out of 5.5 total hectares of of this vineyard. Gorgeous nose of minerals, red flower petals and sweet spices. Lovely flavours that are delicate yet persistent. The texture is silky and the flavours are very long. Hint of minerals/limestone in the finish. A wine with a light body, Plenty of flavour and modest alcohol, just above 12%.